Do you feel self-assured when you smile and laugh? Individuals with brilliant white teeth feel more confident and attractive in social situations. Tooth yellowing and discoloration is common, but can be quickly reversed at Pryor Family Dental. 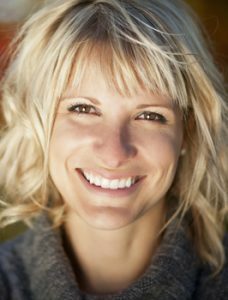 If you feel like your smile could use a boost, come into our office for a gentle whitening treatment. Professional whitening is more effective and safer for your teeth than over-the-counter bleaching methods. We provide both SpaDent In-House whitening and Opalescence Go whitening. SpaDent Flex goes above and beyond other professional whitening formulas. SpaDent Flex can whiten your teeth up to twelve shades in under one hour! Put your feet up and relax while your dentist works the SpaDent magic on your smile. SpaDent consists of safe and natural ingredients that will minimize sensitivity. When you come into our office for SpaDent whitening, we will provide you with a combined teeth cleaning and whitening treatment. You’ll leave our office in less than an hour with a fresh, clean, and stunningly white smile. If you prefer the convenience of whitening your teeth in your own home, Opalescence Go is the perfect solution for you. Opalescence Go is ready-to-go whitening that can be used anywhere, including in the comfort of your home. When you visit us, Dr. Pryor will provide you with the trays, formula, and the instructions that you need. The Opalescence UltraFit tray warms with the temperature of the body for a seamless custom fit. You should wear the tray 15 minutes each day to achieve optimal results. The Opalescence formula contains hydrogen peroxide and PF (potassium nitrate and fluoride). PF will strengthen and protect your teeth while the hydrogen peroxide whitens them. Your hydrogen peroxide level is adjustable and depends on your smile needs and goals. It’s not hard to attain the sparkling smile of your dreams at Pryor Family Dental. Call us today to get started!